Review: Paddington is now very happily settled into the Brown family and the local community. He finds himself in unexpected trouble as he attempts to buy a very special birthday present for his aunt Lucy’s 100th birthday only for the gift to be stolen. 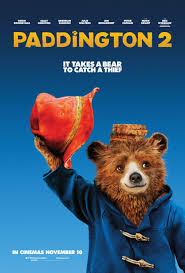 When I first heard that it had been announced that there was going to be a Paddington 2 film I was really worried and thought that it can’t live up to the first one. I have to say that I enjoyed it just as much as the first one. It has been announced that there is going to be a Paddington 3 film out but no release date or any information out yet about it. I have to say that I laughed and cried. There were scenes in this where I almost couldn’t cope they were annoying me so much (especially in the barber shop). There is something for everyone to enjoy in this not just kids. It can be a family trip out. There is a lot in this that kids probably wouldn’t get or understand but parents would. I think Colin Firth was right not to do the voice of Paddington but to hand the part down to Ben Whishaw. His voice suits Paddington so much. It is like he was made to do that part. The C.G. and the digital creation of Paddington is brilliant and it knits together well. You don’t really ever think of Paddington as a C.G. character you just regard him as like everyone else. Hugh Grant practically steals the show. After Florence Foster Jenkins (2016) it is great to see him back plus lovely to see him now take on a type of role we have never seen before. It just shows what else he can do, plus he is really funny. His comic timing is brilliant and I love the way he delivers his lines. There is nothing I can criticise him about. Brendan Gleeson was also fantastic. Even though Sanjeev Bhaskar only had a small part to play I enjoyed seeing him and thought he very good. All the performances were very strong. I could write more and tell you about each one they were so good but I would be here for a very very long time! It is a film I could quite happily watch again. One word of advice is you must stay till the very end with all the credits. Overall this is a very creative and imaginative film with something in it for everybody. This is a fitting tribute to Michael Bond (who created Paddington) who sadly died in the middle of this year and passed away on the last day of filming (Paddington 2).